DC coupled systems are used primarily for extra low voltage DC loads. In a DC coupled system the PV array is connected to a DC load by way of some sort of controller/drive that converts the PV array voltage to the voltage of the DC appliance. In the case of a battery storage bank, a charge controller performs this function. If AC loads are also to be serviced, then a solar inverter or inverter-charger is used to convert DC power to AC power which is then able to supply the AC loads. The extra low voltage of the system means that for high power loads, high currents often need to be carried by heavy, costly copper cables which can also be difficult to manage and costly to install. High voltage battery chemistries such as lithium ion (used by the Tesla Powerwall) are able to ease some of the problems associated with high current but often require specific componentry which can drive up cost. 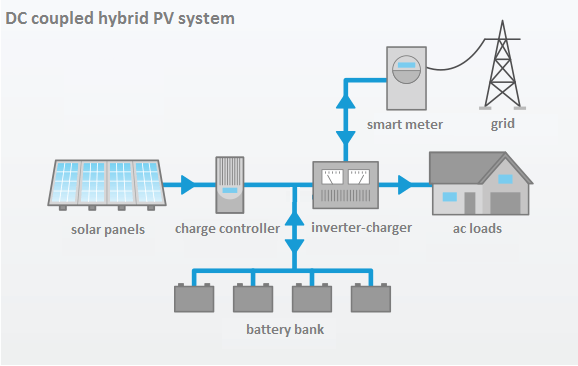 In systems utilising battery storage, all power must be delivered via the solar inverter/inverter-charger. During high power requirements, the solar generating capacity can be ‘crowded out’ by the power supplied by the battery storage bank due to the limited capacity of this component. Therefore an oversized solar inverter/inverter-charger would need to be used to take advantage of the full power output potential of the solar array and the battery storage. This is a more expensive proposition than an AC coupled configuration that provides the same power output. Charge controllers have much more restrictive voltage operation windows than solar inverters, leading to more complicated, time consuming and hence expensive installations. DC coupled systems may have an advantage in simplicity and lower component cost where the power transmission distance is short and the system power is fairly low. If there is a battery storage bank installed as part of the system, the charging efficiency is better than with AC coupled systems as there is no conversion of DC power to AC and back. Off-grid systems that operate 12, 24 or 48 volt appliances as a dedicated load would be an ideal application of DC coupled PV systems.